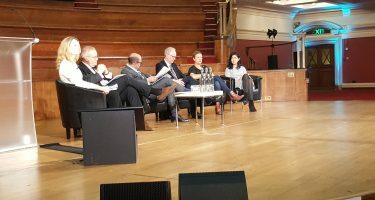 There was a select audience for the Britain Against Cancer conference held in London on the 5th of December. Now that is a big statement name, and I hadn’t even been invited! I immediately wanted to know more. So I went onto the website and found that you could BUY a ticket for £100+, but it also told me that if I was a person affected by cancer I could apply for a FREE ticket on a first come first served basis. I duly did and received one which allowed me to go. Also attending were politicians, NHS, pharmaceutical companies, many charities and some more patients. Not surprisingly as always the patients were in a very small minority. Quite strange really as all the things that were being discussed were about them! The first session was taken up by discussing a very important report to improve cancer services, which is already running a year late. Apparently it is due to be published in 2020. All sorts of usual argument were put, as to why it was already late. I queried if it would even be relevant by the time it is published. Most of the people contributing will be retired before it is finished! The day didn’t get any better than that, as I listened to political jousting, by charities and the NHS as to why we have some of the worst results in Europe. My personal low point was a session about patient engagement hosted by Breast Cancer Now and including Sean Duffy from NHS England. The poor patient rep on the panel looked like she was forced to be there. Naturally there was so much waffle from the panel, that by the time it came to audience participation we were ushered off to see Jeremy Hunt who had arrived early. None of the people there including Mr Duffy had any real idea about proper patient engagement, and they were happy to fund more ‘pieces of work’ to find out more. Interestingly social media was never mentioned when discussing this subject! That summed the day up for me really, it was like the blind leading the blind. No dynamic leadership, only the same old faces going round on the ever spinning money machine which is politics. Whilst trying to cosy up to politicians who are generally trying to further their own careers, and keep their jobs, we have taken our eye from the main goal. Macmillan, Cancer Research, Breast Cancer Now and several others, are spending millions of donated money in political influencing. The NHS has so much trouble to deal with I am quite pleased that cancer is still as high up the agenda as it is! Of course I appreciate that we need to make some plans but nobody who counts seems to realise that people are dying daily from cancer. We are all affected by it, and it’s not about us and them. Whatever we do for a living there is a good chance we will all be a cancer patient at some stage, and it is just not acceptable that we should have some of the worse results in Europe. I can see no dynamic leadership in this sector, and even less of a ‘can do’ attitude. All I hear is negativity and constant talk about money. No business is ever going to have the amount of money they say they need, and an endless supply of cash is not going to solve the underlying issues of our health service. Everyone at the top table of cancer, seems very cosy there, of course they are. But who are they accountable to? Surely us as the paying ‘customer?’ If this was a business, they would all be sacked seeing results as bad as we are seeing, from patient surveys etc. But no, they all move round the table so that there is apparent change. Our healthcare is far too important for politicians now, my working experience is showing me that. All good people who have good intentions, but not effective anymore. Charities and the NHS is another cosy relationship. The same charities working with the same organisations giving us the same results. None of their work is measured by impact, just talk about the money they spend to help people affected by cancer. Unless patients are treated as equals in this, nothing will change. Simple things like offering to pay for the patients time, and having meetings outside of working hours, is a start. People affected by cancer have a lot of goodwill and want to use their experience to help others. I fail to understand how this is not valued at all. Surely we are the missing piece of the jigsaw and the true picture will never be seen without us at the table? As always these are my own views drawn from my personal experiences. Please feel free to share your own. Maybe you are happy with the current arrangement? In 2018 I will be revealing many more reasons why this cosy arrangement is not good for people affected by cancer. Also, how many charity giants fritter your donations on self promotion. I was invited to this but wasn’t free to attend, so it’s a pity I missed a chance to meet you and Jo! There are so many cases of cancer and too many big shots making money from cancer, but thank you for being the voice for the ignored. Thanks so much Deb, yes it would have been great to meet you in person. I was shocked how poor the thing was. Very few patients, and such poor leadership. If this is the best we can do, then I am worried about my grandchildren. Your points are very well made Chris. Why is our NHS paying expensive consultants to develop and propose “ideas” for new ways to solve the cancer conundrum, when there is an army of people like us who’d be willing to offer insight from the real “user” point of view. Spending time inside the NHS system as a customer is the true test of experience . And I wholeheartedly agree about measuring impact of services…. in this case we need to see better outcomes for patients…we know the baseline and to be frank islets far from good. We should now be measuring everythi g invested against improving things from this . Thank you so much Aileen. This is what I really don’t understand? So much incredibly knowledgeable experience, totally ignored by healthcare giants, including the NHS. They are looking to dictate their own ideas, which are many miles from what is actually required. I totally agree with what you posted – it is shocking that the NHS thinks it acceptable for us to have such poor cancer care – worse that most countries in Europe. With your punch and enthusiasm, and all you readers, can’t we start to lobby ourselves for better cancer care? I have ‘taken on’ several Govt. offices this year, from DWP over benefit mis-management to making local NHS pay when I had to go privately to get the care I needed, so I know that even as an individual, if you select your target carefully, you can make a difference. Cancer patients did this in USA – can we get together and do this in UK? Hi Verite. I have always been sceptical about the relationship between cancer charity giants and politicians and have written many times about it. But in the last few months my inbox is full with people agreeing and now having confidence to say it publicly. If you see my first post of 2018 you will see that it is my intention to do just that. I want to try and bring us closer together so that we can have more impact. You know me, I don’t just want to create another group for the sake of it.We must get things moving and get people to see what their hard earned donations are being wasted on. You know me – I like to get on and DO. Am fully behind you if you want to stir things in 2018 – I am behind you in pressing for better care for Survivors! I will certainly be stirring things during 2018 Verite and thanks so much for your offer of support! I can’t wait to hear what you are up to. You always have something interesting to say. https://www.google.co.uk/amp/s/helloverajuice.wordpress.com/2017/12/06/cancer-strategy/amp/ My blog post of the same day! Great minds think alike.